Events on the other side of the world last year produced other uncomfortable questions for BP. The Gulf of Mexico oil disaster highlighted the environmental and social cost of drilling for oil and gas. In West Papua's case, these costs are less visible to the outside world because news about Tangguh is harder to access, due to the transport and communication difficulties in the region. Despite the social, human rights and environmental risks, BP is pushing ahead with plans to expand the Tangguh LNG project: a third production 'train' to add to the two trains already in production will be built by 2014. BP has also acquired an offshore exploration concession for oil and gas in the Arafura Sea south of Timika and is thought to be planning to acquire further oil and gas concessions in the surrounding area. Put these together with four newly signed coalbed methane contracts in Central Kalimantan and another gas project in East Kalimantan, and BP's commitment to expanding its Indonesian interests becomes clear. Demand for LNG from abroad remains high, with Tangguh's output being shipped to markets in China, the USA and South Korea. Japan and Taiwan are also potential importers of Tangguh’s LNG. As well as this, BP has been in discussion with various parties to begin supplying LNG to the Indonesian market. There have been reports of potential contracts to supply LNG to power stations in North Sumatra and even the possibility of supplying LNG to a proposed new petrochemical plant in West Papua itself. It is clear that the demand for new and more plentiful energy supplies is prompting Indonesia to try and meet that demand, particularly through the Tangguh project. 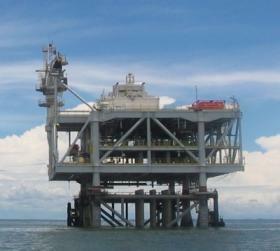 BP and its Indonesian counterpart BP Migas are aligning themselves to benefit from this push. Meanwhile, against a backdrop of economic growth throughout Indonesia, the push for ever greater profit and growth has been highlighted by a recent announcement that the Indonesian government is looking to renegotiate the price of its LNG sales contract with one of the Tangguh's biggest customers, the China National Offshore Oil Corporation (CNOOC). The dark cloud growing on the horizon behind this Bintuni Bay energy bonanza is the dangerous political situation that is developing in West Papua. For many years DTE has been reporting on the human rights situation in West Papua and has highlighted the need for local communities to be taken into account by governments and companies when launching new initiatives and deciding upon government policy. DTE has consistently called for development to be rooted in and responding to the needs, interests and priorities of local communities. Meanwhile, mega-projects such as BP Tangguh have been pushed ahead under the banner of bringing progress and development to West Papua, but with the main objective of extracting natural resources for far-away markets and energy demands. Since the beginning of the Tangguh project, DTE, along with various other NGOs and civil society actors, has attended meetings of the Tangguh Independent Advisory Panel (TIAP) in order to push BP to recognise and respect community rights to lands and resources, and to address local concerns about this mega-enterprise. TIAP was set up by BP in 2002 to "provide external advice to senior decision-makers regarding the non-commercial aspects of the Tangguh LNG project". Increasingly, the independence and effectiveness of the TIAP process has been called into question. In 2009, Lord Hannay, one of the then TIAP panel members, accused some of the NGOs of "crying wolf" over the human rights situation in West Papua. Two years on, although BP Tangguh has made efforts to insulate itself from some of the problems of operating in West Papua, it appears unlikely that the project can avoid getting mired in the wider problems afflicting the region. Conflict, killings, strikes and corruption continue to dog the Rio Tinto-Freeport mine near Timika and an increase in violence in Papua generally means that problems are starting to get closer to Tangguh. The Asian Human Rights Commission recently issued an urgent action outlining the detention and imprisonment of various activists under the charges of 'rebellion' for raising the morning star flag in the regional capital Manokwari. At the beginning of September, a journalist covering the protests of indigenous landowners was beaten up by the district chief of South Sorong and his assistants and pressurised to report in their favour. Neither of these incidents was directly related to BP Tangguh, but they are evidence of growing tensions and discontent in the region following the July Peace Conference (see separate article Ending Conflict in West Papua) and other political developments. There remains widespread discontent with the failure of Special Autonomy to address Papua's problems. The question of population balance also feeds the tensions. A recent report on the overall situation in West Papua has predicted that the indigenous population, which accounts for around half the population today, will be outnumbered two to one by the immigrant population within the next ten years. All these tensions will only be exacerbated by this further marginalisation of the local indigenous population. The TIAP meeting, held in March 2011 in London, was the first meeting of the 2nd Tangguh Independent Advisory Panel and the first to report on the operations phase of the Tangguh project. The old panel had appeared to get 'mission fatigue' in its role as a source of independent advice for BP. However, the new panel, as well as having a more limited mandate and consisting of only two members, also seems to have got off to a slow start. At the latest meeting, only one panel member was present; Augustinus Rumansara, environmental advisor to the Governor of Papua, a previous chair of the Asian Development Bank's Compliance Review Panel and former employee of BP Indonesia. Gary Klein, a partner in the law firm DLA Piper, continues to serve as the panel's 'counsel and secretariat' and acted as the second member of the panel for this meeting. Having agreed to be part of the panel, the US Senator Chuck Hagel withdrew from it in March 2010. In June of this year, US Senator Tom Daschle was announced as the new second member and chair of the panel. What role does the presence of BP Tangguh play in this picture of increasing discontent and conflict in West Papua? At the recent TIAP meeting, DTE raised specific questions about the situation in the surrounding area of Bintuni Bay. Our questions were based on the result of prior consultations with CSOs and community representatives in West Papua and Jakarta. We asked about claims for compensation for the Sebyar and Immeko communities, and sought clarification on BP Tangguh's social, health and welfare programmes for the north shore communities in Bintuni Bay. The meeting discussed a proposal for a human rights advocate for Bintuni Bay. We conveyed the message from Yan Christian Warinussy, the director of LP3BH, a human rights advocacy organisation based in Manokwari, that BP needs to proactively support the reporting of the human rights situation in the region. DTE reminded BP of the recent OECD ruling against BP in relation to the Baku-Tblisi pipeline, which calls on BP to take into account the human rights context of their projects. BP staff at the meeting agreed to 'seriously consider' the proposal for a human rights advocate for the Bintuni Bay region and to 'take it forward'. DTE understands that since then, BP has agreed to fund this proposal. One of the main issues to emerge at the meeting was grievance procedures at BP Tangguh. There was agreement that these procedures aren't being taken advantage of in order to air and resolve community concerns and that they are too complicated and often culturally inappropriate. DTE also raised concerns about BP's community development programme, reported by an Indonesian civil society organisation, UCM-Jakarta, which is working with local communities on the north shore of Bintuni Bay. In both this and the Sebyar and Immeko compensation claim cases, the bureaucratic grievance procedures at BP have not produced results. It is clear from these complaints that the reality on the ground in these communities is very different to the rosy picture that is painted by BP itself in much of its corporate literature and publicity. Other issues discussed at the TIAP meeting included the employment of local Papuans. On this, BP reported that the local Papuan employment targets for 2029 are unlikely to be met. On the issue of resettlement, it was pointed out that concerns had been raised by BP's financial backers as to the sustainability of the resettled villages.On financial transparency, public and trackable information about revenues from Tangguh was lacking still. The meeting discussed the role of women in the Bintuni Bay area and the need for gender considerations to be central to all aspects of the Tangguh project. Also, the ongoing question of Tangguh's failure to use carbon capture and storage as a means of reducing carbon emissions was noted. These issues and others were discussed, but after all the talking, the wider, more obvious question remained unaddressed: who stands to gain most from Tangguh, and who will suffer the lasting social, human rights and environmental impacts? DTE's summary of BP's social, human rights and environmental commitments is on our website in Indonesian and English at /story/tangguh-bp-and-international-standards. The document is an attempt to bridge the information gap between BP's rhetoric and the reality on the ground in Bintuni Bay (and more widely in West Papua), and to provide local communities a tool with which to hold BP to account. It is clear that BP's claim that the Tangguh operation is a 'worldclass model for development' remains an empty boast, given the problems identified at Tangguh itself and given the inequalities and growing tensions that still mark out West Papua today. http://www.thejakartapost.com/news/2011/09/20/workers%E2%80%99-strike-continues-freeport%E2%80%99s-grasberg-copper-mine.html. See alsoBintang Papua, 19 September 2011. See also recommendation 3, Section 8, TIAP first report on Operations phase, January 2011. See: http://www.downtoearth-indonesia.org/old-site/73tan.htm. This claim is still repeated in the literature surrounding the Tangguh project today, even in the most recent TIAP report from January 2011 and BP's recent press release on Tangguh of 17 June 2011.